Pewaukee drivers who are old enough have probably heard the term “fan belt.” Back in the day, the radiator fan in your vehicle was turned by a belt driven by the engine. There are still belt driven fans, although most are now driven by the serpentine belt. But most Pewaukee vehicles now have electric fans that draw fresh air across the radiator to cool it. As coolant/antifreeze circulates in the cooling system, it captures heat from the engine and flows into the radiator. Air cools the radiator and the coolant in it before it sends it back into the engine to pick up some more heat. Now your engine has an ideal temperature range in which it is most efficient: it shouldn’t be too hot or too cool. The electric radiator fans help maintain the ideal temperature. A lot of Pewaukee citizens’ vehicles will actually have two radiator fans. One, both or neither may be running at any given time depending on the conditions. When you are cruising at Brookfield highway speeds, the air rushing over the radiator and around the engine will help control the heat. By contrast, stop and go driving around Pewaukee doesn’t generate much natural air flow so the radiator fans will be working hard. Some Pewaukee drivers may hear the sound of the radiator fan running after turning the vehicle off. This keeps the engine from heating excessively after it has been run and shut off. Now the radiator fan motors and the switch are wear items that will eventually fail. If your temperature light comes on while driving, you have a cooling system problem. 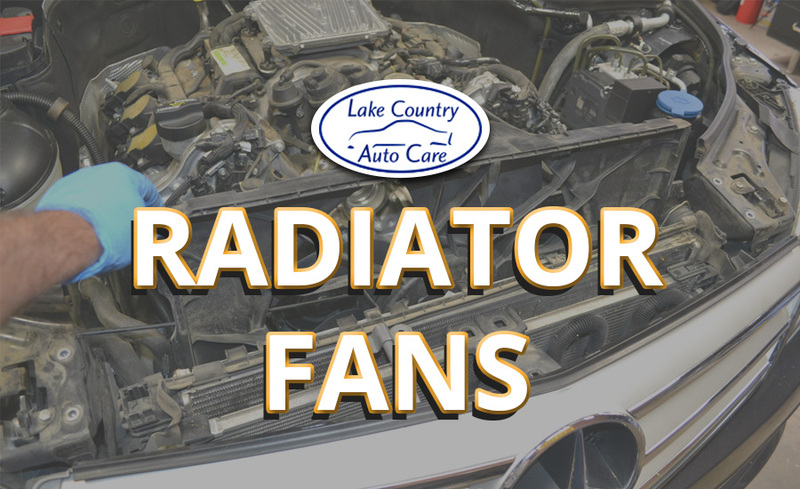 Your friendly and knowledgeable Lake Country Auto Care service advisor can test your entire cooling system, including the radiator fans, to determine what is causing the indicator light. Of course, servicing the cooling system as recommended will help extend the life of all the components. Ask your Lake Country Auto Care service advisor if you are due for a cooling system service. < Help Us Give Back To The Community!